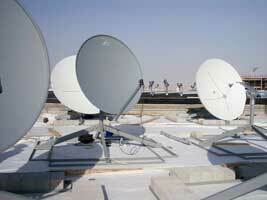 VSAT satellite dish installers in US and Qatar, Middle East. Sat-Link Communications is a 28 year old company serving the satellite industry in the US and abroad. 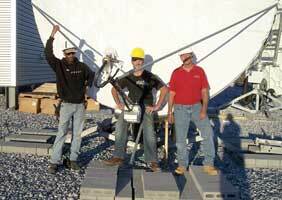 Built on Integrity and Quality Craftsmanship, Sat-Link Communications was established in 1984 and has evolved into one of New Jersey and Colorado's largest and more reputable Digital Satellite Service & Audio/Video Installation Companies. Sat-Link Communications is your single-source solutions provider for satellite-based networks and deployment requirements. Serving New Jersey, New York and the Colorado area, they also cover the Continental US and Abroad. 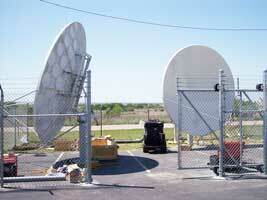 Specializing in C/Ku band VSAT installations and deployment. more pictures and customer testimonials. The pictures shown here are installations of 3.8m VSATs for government services in Texas, Maryland and overseas in Qatar, Middle East. This page has been added at the request of Sat-Link Communications. It is for information only and is not a paid-for advertisement. All Pages on this satsig.net web site are Copyright Satellite Signals Limited � 2010 all rights reserved.